Sometimes, it's hard to share a really juicy scoop — like where you scored those amazing ankle boots for 75% off — because you don't actually want the secret to get out. We feel you, because we're in the same spot: We're totally smitten with Crepes on the Corner, a hidden-away cafe in SE Capitol Hill, and part of the charm of this regulars-only spot is that it's undiscovered. Imagine this: You can sip a perfect latte and demolish a crazy-good crepe — without jostling for a table or waiting in line. Heaven, right? 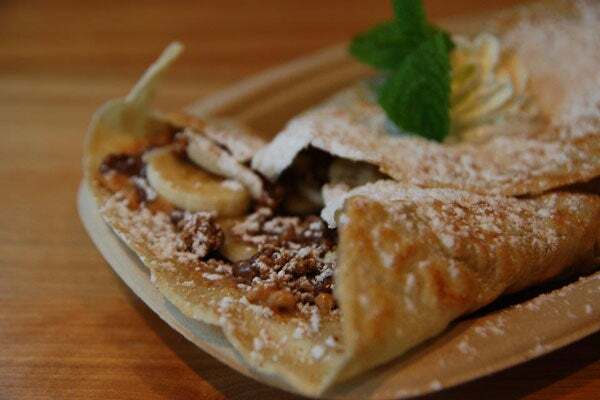 We highly recommend the Italian crepe with chicken, capers, roasted red peppers, and buffalo mozzarella, or the Presley, a sweet confection with nutella, peanut butter, banana, and peanut butter cups. Top those off with a piping hot cappucino or an iced coffee, and you're set for an excellent weekend. But, hey — let's keep this on the DL, okay? Where: Crepes on the Corner, 257 15th Street SE; 202-525-4795.